Mr. H.M. HUGHES, Highbury, Havelock Road, Shrewsbury. 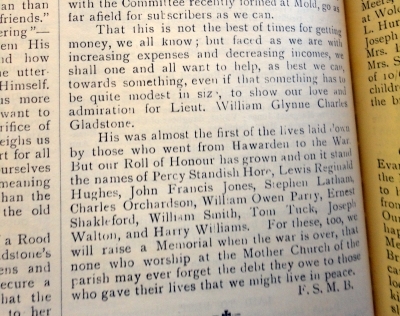 I found Lewis Reginald Hughes’s name in the Hawarden Parish Magazine, his name was among other Hawarden men who had perished in the war and I have researched them all, including Lewis, but unlike the others, I cannot find a connection to Hawarden unless he came here after the 1911 census. Or perhaps the man that I did find is not the right one, but he is the only one that I can find Army information on. See Hawarden Parish Magazine above where his name is mentioned. Lewis Reginald Hughes in the UK, Soldiers Died in the Great War, 1914-1919 tells us that he was a 2nd Lieutenant in the North Staffordshire (Prince of Wales) Regiment (4th Bn) attatched to the Scottish Fusiliers and he died of wounds on the 19th May 1915. L R Hughes in the UK, Army Registers of Soldiers’ Effects, 1901-1929 tells us that the sole Legatee was his father Arthur Johnson HUGHES, Esq. 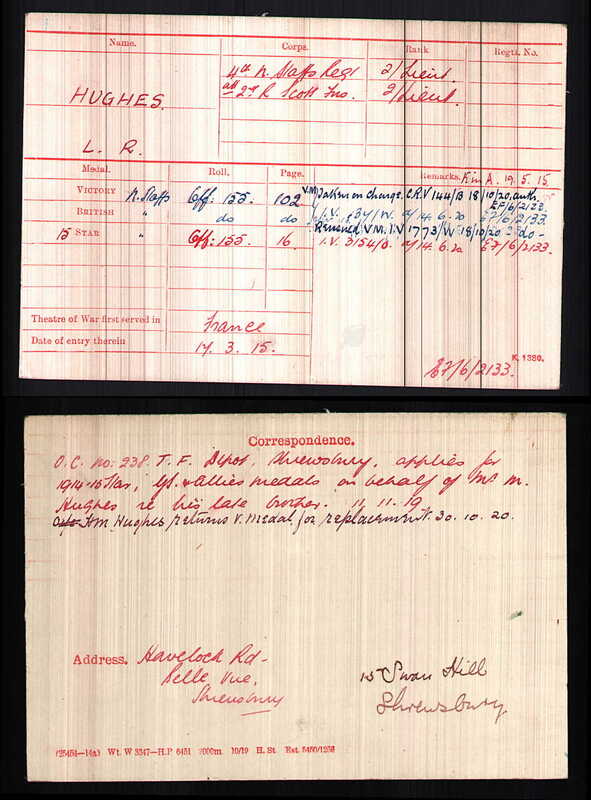 Who was paid £44 7s 6d on the 25th October 1915. L . R . Hughes is also listed in the UK, British Army Lists, 1882-1962, but I have no information on this as I would have to pay to get it and I do not know for certain that he is the right soldier. If this is he I can only presume that as he trained to be a Solicitor he may have moved to the area, but on all the censuses he is shown living in Aberystwyth, but could, of course moved to the area between the 1911 and the beginning of the war. Lewis Reginald Hughes, Second Lieutenant, North Staffordshire Regiment. Lewis was born in 1882, the son of Arthur Johnson Hughes, who was Town Clerk of Aberystwyth, and Mary Elizabeth Hughes, of Aberystwyth. He was a solicitor prior to the war, and commissioned into the 4th Battalion, North Staffordshire Regiment on 15 August 1914. On 17 March 1915 Lewis arrived in France, and was attached to the 2nd Battalion, Royal Scots Fusiliers. The battalion was attached to 21 Brigade, 7th Division, and was in action at Neuve Chappelle. During May 1915 they fought at the Battle of Aubers Ridge, and the ensuing Battle of Festubert. Lewis was badly wounded at Festubert, and was evacuated to the nearby hospital at Bethune, where he died on 19 May 1915. Lewis was 32 years old, and is buried at Bethune Town Cemetery, France. The family history I have for Lewis shows that his birth was registered in the December quarter of 1882 in Aberystwyth, Cardiganshire (Volume: 11b Page: 56) and he appears for the first time on the 1891 census living with his parents at Laura Place, Aberystwyth, Cardigan. Head of the household was his father Arthur Johnson Hughes, 43, a Solicitor, his mother Mary Elizabeth, 38 and their 3 children, Florence Mary, 18 and single, Herbert A., 17 and single and Lewis Reginald, 8, both Scholars. There were 2 servants, a Cook and a Housemaid. The 1901 census shows Lewis was a boarder at Bradfield College, a Public School in Bucklebury, Nr. Reading, Bucks. He was a Student aged 18. 1911 sees Lewis back home at Buarth Lodge, Banadl Road, Aberystwyth, Cardigan which had 9 Rooms. His father Arthur Johnson Hughes, 63, was still head of the household and now a Solicitor and Town Clerk and bilingual, he tells us that he and Mary Elizabeth, 58 had been married for 39 years and 5 children had been born to them, all still living. Mary Elizabeth spoke only English. Lewis Reginald was now 28 years old and an Articled Solicitors Clerk and like his mother spoke only English. No other family members, but 2 servants were in the household, but the census does not tell us their duties. I have found a possible death of Lewis’s father Arthur Johnson Hughes age 72 in the March quarter of 1919 (Aberystwyth Vol. 11b, Page 86) and one for a Mary E. Hughes, age 64 a few years earlier in the March quarter of 1917 (Aberystwyth Vol. 11b, Page 80). Of course the certificates would have to be purchased to confirm or deny. If anyone can shed any light on his connection to Hawarden, other than his mention in the Rector’s Letter in 1915, I would be very grateful. All I can tell you about ‘Rex’ is that he came to Lampeter and attended Keble College and graduated in 1906. My thought is that the Hawarden link could be that he was articled to a solicitor there but haven’t been able to verify this. Good luck! Sarah then kindly sent me this :- I’ve attached a brief outline of Rex’s life from the information we’ve gleaned from College Records, newspapers, Ancestry etc. This will form part of an exhibition and, we hope, a memorial booklet. More than thirty members of the college lost their lives in the war. With regard to Rex and his link with Hawarden, all I can think of is that, having graduated, he might have trained there as a solicitor, but I can find no evidence for or against this theory… We have a gap from 1906-1914 to be accounted for so he could have got up to almost anything! Most of our students are commemorated on more than one memorial – the trickiest one to figure out (apart from Rex) was also commemorated in the parish church attended by his fiancé, so maybe Rex had romantic interest in Hawarden? Do please let me know if you have any luck. And please let me know if you find any errors in my research. Born in 1883, Lewis was the son of Mary Elizabeth and Arthur Johnson Hughes, a Solicitor and the Town Clerk of Aberystwyth. Lewis, known as ‘Rex’ to his friends, had three siblings, Florence, Herbert and Meyric, and the family employed two domestic servants. He was sent away to be educated at Bradfield College in Berkshire, before returning to study History at St David’s College in the Michaelmas term of 1901. Lewis did well at Lampeter, earning the £30 Traherne Scholarship and first class marks in his examinations. Lewis was also involved in the social life of the college and his portrayal of ‘Susan’ in the college’s production of The New Boy was described as ‘a true portrait of the present day maid servant’. He was also a member of the English Debating Society and a founding member of the ‘Tatler’s Club’, a literary society for whom he read a paper on Voltaire. An active sportsman, Lewis played football and cricket and was the captain of the tennis team. When Lewis went up to Oxford to spend a year at Keble College, he took part in their Freshman’s Soccer Trial and joined the First Association Football XI team of 1903-4. Lewis returned to Saint David’s College to complete his degree before moving back to Aberystwyth. Having qualified as a solicitor, Lewis had been practising in his father’s office for a number of years when war broke out. He was described as having ‘promise of becoming an effective advocate’ but Lewis volunteered almost immediately for active service and, on 15 August 1914,enrolled into the 4th Battalion, North Staffordshire (Prince of Wales) Regiment as a second lieutenant. Having spent the winter months in Guernsey, in the spring of 1915 Lewis’ battalion was posted to France where he was involved in the fighting at Neuve Chapelle. During this period he was transferred to the Royal Scots Fusiliers with whom he saw action at the Battle of Auber’s Ridge. Having survived these engagements, Lewis was fatally injured at the Battle of Festubert. In spite of receiving medical treatment at the nearby field hospital of Bethune, Lewis died on 19 May 1915 at the age of 32; he was buried at the nearby Bethune Town Cemetery and his headstone bears the inscription of ‘R.I.P Jesu Mercy’. 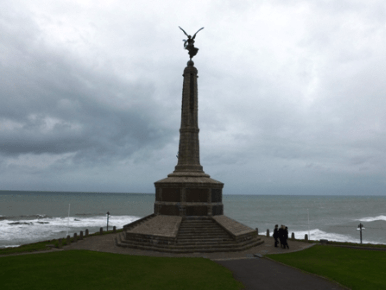 Lewis is commemorated on the Aberystwyth town War Memorial and on the St David’s College War Memorial. Photo of Rex from College Records. Many thanks to Sarah Roberts for sharing with us.